It's no secret that I have a bit of a thing for Matt Ottley's illustrations. In particular, I love Sailing Home, Parachute and Tree....and now I can add Teacup to that list. 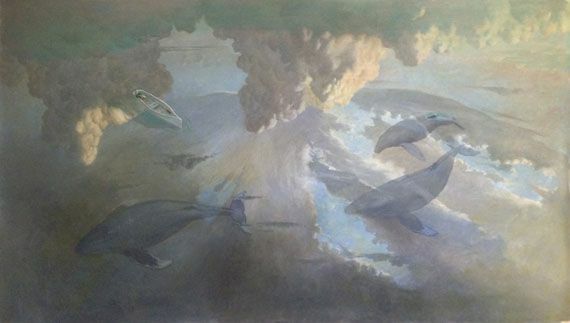 The soft, dreamy palette of the early pages grows stronger and more vibrant as we head out to sea. 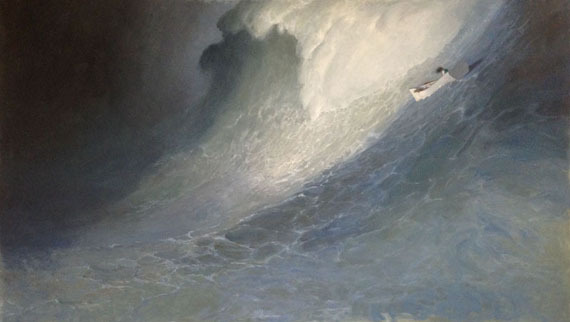 At this point, Ottley's oil paintings remind me not only of those he used in Sailing Home, but also, at times of some of the more iconic scenes in the movie of the Life of Pi. I could spend hours pouring over Ottley's illustrations - he effectively uses reflections and transparency to draw your eyes to all the details. This is one of those magic picture books, though, where the collaboration between author and illustrator is close to perfect. The story flows seamlessly between the text and the pictures and back again. Young uses finely pared language & concepts to create a refugee and self-discovery story that is perfectly suited to preschoolers. 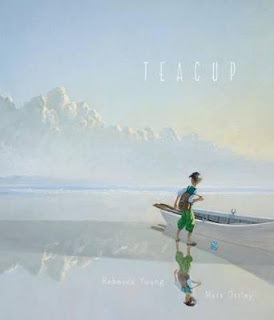 Infused with hope, courage and the possibility of new beginnings, Teacup is a poignant, tender story worthy of a 2016 CBCA nomination. Oh I love Matt Ottley's work too. I can't wait to find this one, it looks divine. I think you're right about the nomination. Those illustrations are breathtaking. I didn't know Matt Ottley before, but I'll definitely be perusing his print shop. Thanks for sharing these beautiful illustrations. I am not familiar with this author.